Greetings! I hope you enjoy the pictures I've scattered throughout this page. Washington is a beautiful state, and these photos are a small representation of the richness and diversity you'll find in "the Evergreen State." I live on a mini-farm in the Pacific Northwest with my husband, daughter, three horses, two cats, approximately a dozen Collies (we're a dog show family), and one Scottish Deerhound that doubles as a sofa cover. 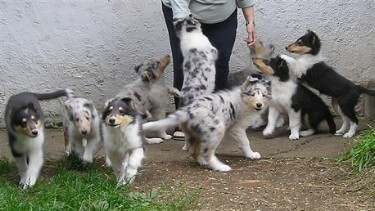 Seven of the 10 Collie pups from this year's litter. in the middle is torn between mobbing me and rushing the photographer. Our domicile is an old pioneer place, and the thing that most endears it to me is that I'm younger than my house. Unfortunately, I'm older than the furniture (though not by much). The house has shadowy, mysterious hallways--I've tripped over a dark-coated dog many a time. I like to tell friends I live in a tri-level, but it's actually just an illusion caused by warped floors. My husband Rein and I like to get away often, taking off for a few days at the ocean or the lake, and I usually bring my laptop with me on these excursions. I also have two friends with whom I do mini writing retreats, and while we spend a lot of time giggling and eating junk food, we also brainstorm like crazy and make significant progress in our writing projects. There's nothing like a change of scenery to get the creative juices flowing! Writing comes naturally to me. I made up stories as a child and have always lived in my head and my imagination. I was an shy kid and an avid reader, checking out at least one book a day from the library. And then came that fateful day that would change my life forever: innocent and dewy-eyed, I picked up pen and paper and began to write. I started my writing career at the precocious age of eight by writing poetry, and the only person who seemed impressed was my mother. From poetry I graduated to writing novels at age twelve, including one fatally unremarkable story about a wild horse named Moon Mist (probably related to the above horse). The years rolled by, I grew up, got married, and had 3 children, but writing never seemed to leave my life. When the youngest of my three children was in kindergarten, I saw a class offered through the local community college called "Writing for Fun and Profit." I signed up, and one of my first class efforts was a long novella spawned from a dream I'd had. It was so ridiculous that when I read the story in class I kept bubbling into hysterical laughter. The class, thinking I was an exceptionally fine humor writer, guffawed right along with me. 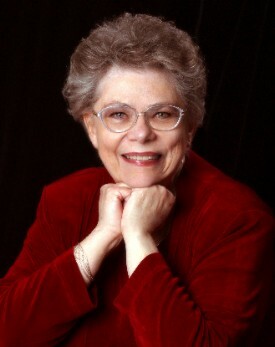 After that, I started attending conferences and workshops, but it wasn't until I began reading Georgette Heyer and other Regency romance authors that I wrote my first real romance. I still remember the thrill when I wrote "The End" that first time. My activities in those bygone days included a variety of projects—writing and otherwise. I stayed busy writing essays, articles, short stories, novellas, children's stories, and poetry. Back in the 80s and 90s I worked for an internationally known bookstore and co-edited their catalog/newspaper, wrote and edited book reviews, and wrote a column. I learned a lot about life's lessons during my bookstore days, and one of the most valuable was when to stand up for what I believed in and when to surrender with grace. As the old Kenny Rogers song goes, "know when to hold 'em, and know when to fold 'em." I was a glutton for punishment back then, and as my children grew, so did my writing. I joined several writer organizations and soon I was slinging ink with the best of them. I entered writing contests and racked up some nice wins. I became a writing mentor and writing contest judge. The next thing I knew, I was giving workshops and presentations. Am I resting on my laurels? No way! My most recent project is a short story titled "Sentimental Journey," which appears in the Blue Moon Enchantment anthology, ISBN #0-9746249-7-7. I have various other projects I'm working on, including a Regency-set historical. I've been enamored with highwaymen ever since I first read Alfred Noyes' The Highwayman, back in the eighth grade. I always knew some day I'd turn to writing about one. And the day finally came. My current project is about buried treasure and lost jewels, a sheltered young woman drawn into the adventure of her life, a highwayman bent on revenge, along with plenty of romance, and some quirky secondary characters to add fun to the mix. In addition, I have ideas for other writing projects burbling around in my brain, so watch this space for further developments! I found a very powerful and life-changing book. It's The Intention Experiment: Using Your Thoughts to Change Your Life and the World, by Lynne McTaggart. For anyone of a scientific bent, who believes it's nonsensical to think we can change the world by our intentions, this book will make you think again. It reports on rigorously conducted scientific experiments that give powerful evidence that all life is interconnected and our thoughts have influence we can barely begin to dream of. The second part of the book details ways in which readers can set up their own "intention experiments," with specific suggestions for optimizing their use of the concepts. McTaggart ends by inviting readers to participate in "the largest mind-over-matter experiment in history." If you'd like to learn more about the book, and the experiments, go to the website: http://www.theintentionexperiment.com/.